Imperator Fish assures us, Harry Hindenberg: they haven’t got me. Yet. I don’t pay too much attention to Law Society rules and regulations, because I’m a busy man and I don’t have time for all that bureaucracy. Ethics and standards are the sorts of things that sound nice in theory, but when you get busy they just slow down your work. From Open Parachute, Truth about those science fairs – every parent will relate to this! The Boar Soars on Porcupine Farm! What happens if you get raped in Sudan? The police ignore your complaint, then charge you with adultery…. When it was being forced through the House, the Green Party strongly opposed the VSM bill. We knew the damaging effect it would have on the student voice, including student media. It’s sad to see MASSIVE become a victim of this. And Jan Logie asks if New Zealand is The Land of Plenty? New Zealand has long been known as the Land of Plenty, and with good reason – the land and the sea provided many people with an abundant healthy diet; we were the first country in the world to achieve an 8 hour working day and we were considered the ‘social laboratory of the world’ with cradle to grave support for those who needed it. 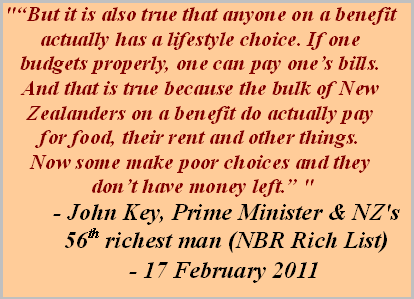 But yesterday, Statistics NZ revealed that for half of all of us, New Zealand is the Land of Not Enough. REPORTERS all over the planet die to tell stories. From the Philippines where journalists were massacred in Maguindanao on the southern island of Mindanao in 2009, to Mexico where journalists families are targeted with threats of torture. So the big political story on TV3 news over the last few nights has about a bunch of reporters in TVNZ’s Maori and Pacific Unit acting as Labour Party activists. It’s a good story, and another indication of how comprehensively the TV3 political journalists are setting the news agenda and dominating political reporting. New Zealand Parliament – List of questions for oral answer – Wednesday – 19 February 2014..
Plus, don’t forget to check out The Standard! Polity! The Transport Blog! And Russell Brown on Public Address!